Found throughout northern temperate regions, feverfew is widely used today as a migraine remedy. Earlier herbalists thought of it as "a general strengthener of the womb" (Nicholas Culpeper, 1653). It has also traditionally been used to treat arthritis and rheumatism. Numerous cultivars have been developed as garden ornamentals. 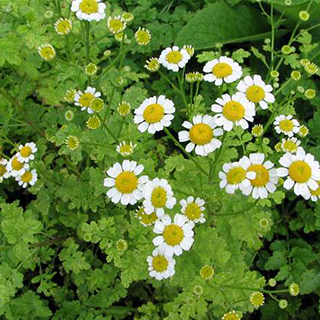 Feverfew is a good nervine tonic with specific application against migraine and low spirits. Part of its anti-migraine effect is due to its anti-inflammatory activity and part due to the positive bitter digestive effects. Use 5–10 drops at 30-minute intervals at the onset of a migraine. It is most effective for preventing and treating “cold” type migraines involving vasoconstriction, which are eased by applying a hot towel to the head. For the acute stages of rheumatoid arthritis, add up to 40 drops (2ml) 3 times a day to herbal remedies such as celery seed, white willow, or devil’s claw (Harpagophytum procumbens). Cook a handful of leaves in a little oil and apply to the abdomen as a poultice for colicky pains. Drink 1 or 2 cups of a weak infusion made from 1/2oz (15g) of the aerial parts to 1 pint (600ml) of water after childbirth to encourage cleansing and tonifying of the womb; take 1 cup 3 times daily for period pain associated with sluggish flow and congestion. Prefers full sun and well-drained soil, but tolerates a range of conditions. Sow seeds in a propagator at 50–64.4F (10–18C) in late winter or early spring, or take softwood cuttings in early summer. A prolific self-seeder that can be invasive. Collect the leaves as required throughout the growing period and the whole plant in summer while flowering.